Arkansas has a tumultuous history with racial equality. Central High serves as a constant reminder of the struggle for equality. While Arkansas has its own heroes in this struggle, like Daisy Gatson Bates and the Little Rock Nine, Martin Luther King Jr. is a hero to everyone who strives for freedom and dignity for all. If you're just visiting Arkansas or have never visited, the Central High Museum site is an excellent place to learn more about Arkansas' history with racial equality. The Mosaic Templars Cultural Center is another excellent place to go to learn about African Americans in Arkansas. Martin Luther King was born on January 15, 1929. His holiday is celebrated on the third Monday in January. Dr. King was assassinated at the Lorraine Hotel in nearby Memphis. That hotel has been converted into the wonderful National Civil Rights Museum, and is also a nice place to reflect on the MLK Holiday. This free event is hosted by the Arkansas MLK Jr. Commission. It features prayer, gospel artist Melvin Williams and a family comedy show by Marlon Wayans. Arun Manilal Gandhi, the grandson of Mahatma Gandhi will be presenting a keynote. It's at the Jack Stephens Center of UALR all day. RSVP at their website. This is a combination march and parade (called a "marade") that starts on Interstate Park and ends at the Arkansas State Capitol. The Arkansas Martin Luther King, Jr. Commission and Central Arkansas Transit Authority are sponsoring free bus rides. All day on any CAT bus throughout the region. They are doing this to promote the "a day on, not a day off" campaign, and so people can get to the various service events throughout the community. On its 26th anniversary, Saint Mark Baptist Church will have an interfaith prayer breakfast at 7:30 a.m. It's free, but you should call and reserve in advance (501-683-1300). The breakfast is a good time for leaders in the community (and in the church) brunch with locals in honor of Martin Luther King Jr. The Mosaic Templars Cultural Center holds this yearly event which gives kids ages 12 through 18 the opportunity to continue the legacy of Dr. King through service. Each year approximately 100 participants gather at the museum and depart to a variety of locations throughout the city where volunteers are needed. 501-683-3593. The parade kicks off at 10 a.m. in Downtown Hot Springs. There is a program afterwards in Horner Hall in the Convention Center. 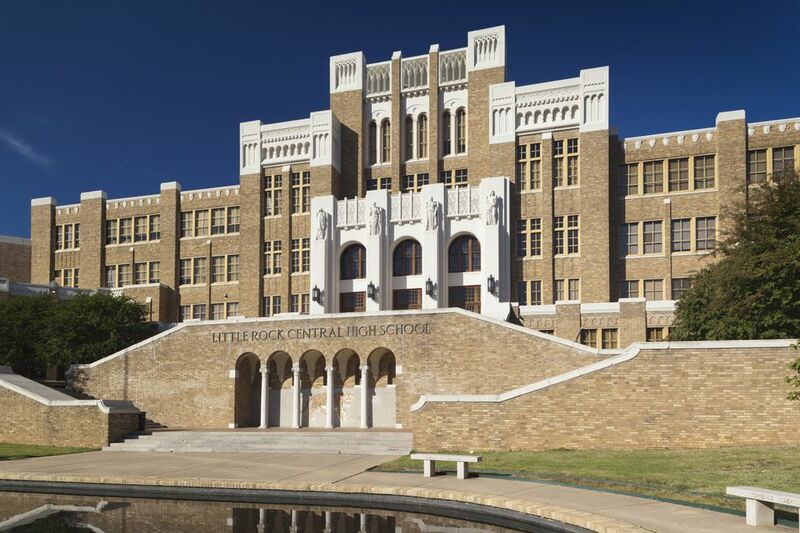 Little Rock Central High is known all over the world for the groundbreaking desegregation battle that took place there in 1957. Today, the school is a functioning high school and a national historic site with a museum and sculpture garden. The visitor center is hosted inside a replica period gas station and contains photographs and information about the site's history. Imagine that it's the night before your first day of High School. You're filled with excitement, fear and tension. You wonder what the school will be like. Will the classes be hard? Will the students like you? Now imagine that you are a black student in 1957 preparing to go to Little Rock Central High School to attempt what seemed impossible—the integration of public schools.